Everest Base Camp Gokyo Lake | Adam Tours & Travel Pvt. Ltd. This excellent trek give to the experience of the breathtaking earth’s tallest Mt. Everest, the journey begins with exciting Himalayan flight to Tensing Hillary airport at Lukla from Kathmandu. Everest trail starts at the upper Phakding and follows the Dudh Koshi valley moving towards the settlement of Sherpa the bustling Namche Bazaar where we will be surrounded by stunning Himalaya views. All long this trail, the view of the villages area consist of magnificent forests of rhododendron, magnolia and giant firs. Everest Chola pass Gokyo trek explores around the breathtaking Gokyo valley which is located adjacent of the Khumbu along with diverse Everest Base camp. The magnificent view of highest peaks, from the west to east as Cho you (8,153m), Gyachung Kang (7,922m), Everest, Lhotse (8,501m) and further way Makalu stands through out your way. The eventual challenge during the Cho La Pass trek is the hike across Cho La Pass (5,420m), which covers both the Gokyo Lake and the Everest Base Camp area (EBC). During Cho La Pass trek there are some short and interesting ascend of Gokyo RI, Chukkung RI and Kalapathar with stunning views Mt Everest, Mt Lhotse, Mt Makalu, Mt Cho you and surrounding Khumbu mountain range. which is the highlight of the trip for the classic views of icefalls and glaciers of Mahalangur Himalayan range. Everest Base Camp Cho-La Gokyo trail’s different shapes of Glacier Lake makes you over whelming and cracking sound of glacier make you fear love. Ngozumpa biggest glacier in the world is another highlight of this trek .The Himalayan rare species wildlife musk dear, Panda, Snow Leopard, mountain goat “Jharal”, colorful “Pheasants” national birds of Nepal can be viewed in this trek. Pine and juniper are the common forest of here as well as colorful rhododendron and magnolia flowers welcome you during the spring which has added the beauty in the trail. The monasteries can be found most of the villages, which makes you spiritual soul, and the flattering flags and Chorten can be seen everywhere. This trek demands a good trekking experience and very good physic as well as moral and applies to well train participants while trekking. Approaching the highest and most spectacular summit on earth and discovering of superb Gokyo lakes as well as maximum altitude view point are the greatest achievements of this EBC Gokyo trek. The unforgettable happiness is waiting your journey in this EBC Chola pass Gokyo Lake journey. Day 03: Flight KTM to Lukla and trek to Phakding (2652m) 2-3 hours. Day 3:Flight from KTM to Lukla (35 minute flight Distance 136.17km) trekking to Phakding (2652m) walking hours: 3 hours, Distance 8 km. Early morning we flight from Kathmandu to Lukla via mountain flight of about 40 minutes scenic flight. With clear weather we get fantastic views of the mountains, including Everest as we enter deep gorge of the Dudh Kosi valley. You begin your trek from Lukla following a gentle climb up the mountainside on the left bank of the Dudh Koshi River. Along the way you will have a view of Mt Nupla (5885m) Kusum Kangaru (6367m) and the Mount Kwongde Range. We then take an easy walk for about two hours to Phakding village for the overnight stop and rest of the time stroll around the village for local knowledge. Day 4:Phakding trekking to Namche Bazzar (3440m) walking hours: 5-6 hours, Distance 11.3km. Set in a natural amphitheatre looking across to the jagged ridge of Kongdi RI (6187m), Namche Bazzar is one of the most attractive settlements in the khumbu region. We will have a full day rest so that we won’t face any problem ahead. Today we make a short acclimatization trek up to Khumjung, a delightful Sherpa village above Namche. You have full day leisure for wonderful panoramic view or stroll around the market You can also enjoy the splendid views of Everest, Ama Dablam, Thamserku, Nuptse, Lhotse, Tawche, and Kwangde and so on. Day 6:Namche Bazzar trek to Tengboche (3867m) walking hours: 5 hours, Distance 10.4km. We start our trek with pleasant walk through the forest with magnificent view of mountains. We follow a spectacular path that traverses around the hillside high above the Dudh Kosi River. After walking one hour you will arrive in Phungithanga. The trail climbs past some water-powered prayer wheels and begins a sustained climb through a forest of tall, mature rhododendrons. Look out for musk deer and Himalayan tahr among the trees. The start of the Tengboche (3870m), the village is scattered across a wide, grassy saddle below a crescent-shaped ridge covered by scrub pines and firs. 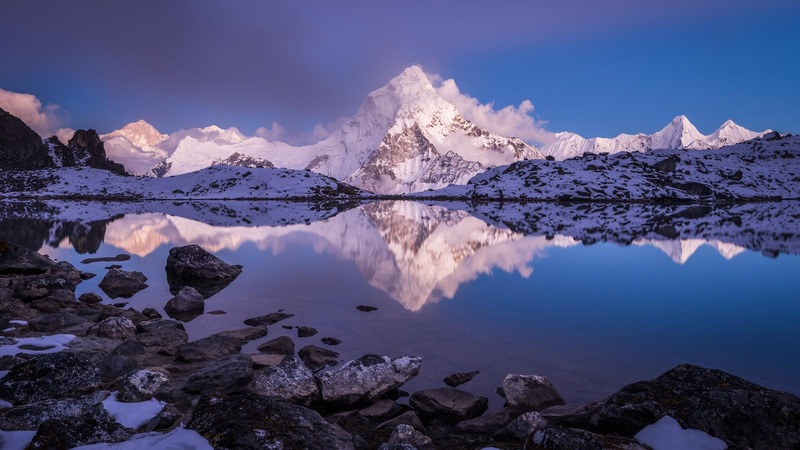 From the view point at the top of the hill, there are awe-inspiring views of distinctive peaks like Amadablam (6856m), standing proud of the massif containing Everest (8848m), Nuptse (7861m), Lhotse (8501m) and inspiring views of Himalayan giants. We visit the Buddhist Monastery at Tengboche, the largest in Khumbu region. It is very important to spend an additional night here to aid to the acclimatization process. It can be along a short hike 400 m climb to the Nangkartshang Gompa on the ridge north of Dingboche. Good view of Makalau (8463 m) from here. You can go for a day walk like trek to Chhukung (4730m) is worth while which takes approx. 4/5 hours from Dingboche but it might ruin your rest. To the north of Dingboche, there are spectacular views of Lhotse’s huge South Face. Day 9:Dingboche Trekking to Lobuche (4940m)walking hours: 5 hours, Distance 9km. Day 10:Lobuche to Gorakshep (5170m), trekking to Everest Base camp (5364m) back to Gorak shep: walking hours: 7-8 hours, Distance 11.4km. Day 11:Gorak Shep trekking Kala Patthar (5545m) and back to Lobuche (4940m) walking hours: 5-6 hours, Distance 8km. Mornings are usually sparkling and clear and this is the best time to climb the Kalapathar for one of the world’s definitive mountain views. We will be rewarded the 360 degree dramatic panorama views of Mt Everest and surroundings mountains like Mt. Pumori, Mt. Lingtren, Mt. Khumbetse, Mt. Nuptse, Mt. Lhotse, Mt. Ama Dablam, Mt. Thamserku along with many other peaks. You will have an easy walk for about 2hrs to reach Lobuche. Stark and rugged beauty creates almost moonscape campsite at Lobuche a wind swept collection of huts tucked in a narrow meadow between the glacier and the Lobuche peak. Tawoche and Nuptse are particularly spectacularly from Lobuche towering. Day 12:Lobuche to Dzongla (4830m) walking hours: 2-3 hours, Distance 4 km. From this route both Pheriche and Dhugla are visible as well as other good mountain views. We then follow the Lobuche Khola downstream where, after a while, we take a trail to the right heading off towards Dzongla. Stay overnight at the village of Dzongla. This day you start to walk early in the morning. You have to walk three hours to get on top of the Chola, before you get Chola-pass you have to be about 20 minutes on ice. The trek to the Cho La pass can be a rather difficult route. But on the way you will be able to experience the best part of your hiking; difficult but very worthy. In good weather you can cross the Cho La with no special equipments but warm clothing and an ice axe might provide added peace to mind. The path skirts around the ridge, staying mostly level. Day 14:Thangnak trekking to Gokyo Lake walking hours: 4 hours, Distance 8km. Today is your short day walk to Gokyo Lake. Its only two hours walk from Thangnak but its really beautiful walk through the Ngajumpa glacier. After crossing an iron bridge over an stream the trial levels out as it follows the valley past the first lake, known as Longpongo at 4690m, where we get chance to observe the Lama footprints on a stone.The second lake, Taboche Tsho mesmerizes us by the shimmering turquoise blue sheet of water sparkling in the sun. Little we reach the third lake, called Dudh Pokhari, linked by a surging stream to the previous one. Gokyo village stands by the third lake and Cho-Oyu Mountain. Above the lake provides panoramic views of Cho Oyu, Gyachung Kang, Lhotse, Makalu, cholatse and Tawache. The trail first descends steeply out of the valley through beautiful rhododendron forests. We arrive in Phortse Thanga and crossing the river over a suspension bridge. We ascend up a sandy slope to the Dudh Kosi River. The route ascends to the valley of Dudh Koshi and down to Khumjung. Finally we reach the Namche valley. Day 17:Namche Bazaar trekking back to Lukla (2850m) walking hours: 7 hours, Distance 19.4 km. The descent from Namche to the Dudh koshi can be the hardest stage of the entire trek. The trail descends over the ridge past rocky cliffs and scattered pines to the tiny village of Tokthok. Although the path is all downhill, the unrelenting slope places massive impact on the knees. Once you cross the high suspension bridge, the path runs mostly level. We will work though rhododendron and pine forests with the view of distance snow covered peak before arriving Phakding.after lunch here we will continue gentle walking to Lukla, the trail drops steeply and runs level though out the day, enjoying the lush green scenery around and passing through the incredible mountain scenery and local Sherpa village arrival in Lukla, you will have time to stroll around the local areas and have a good shower. Today you will have a free day in Kathmandu valley. Have some rest in your hotel. You can also take a leisurely stroll over the streets and buy some souvenirs and remembering from Nepal. At evening we will have a typical Nepali dinner accompanied with cultural shows. Best Travel Time: February to May, September – November are the best seasons. Dec & January are Winter and cold can be snow on the trail, June, July & August are rainy time, trekking can be done but visibility can be poor due to rain and Lukla flight may get canceled.